Greater Vancouver’s real estate market is in the throes of chaos as buyers, sellers and industry insiders try to adapt to a new tax on foreign buyers that went into effect on Tuesday. Though a recent poll showed nine out of 10 British Columbians back a tax on foreign buyers of residential real estate, many industry insiders and entrepreneurs are lining up against it, saying it risks destabilizing the housing market and Vancouver’s economy. The tax has even taken on shades of a political controversy, as a prominent Vancouver real estate marketer and provincial Liberal fundraising chief denies he knew in advance the tax was coming. Vancouver realtor Steve Saretsky told Global News his analysis of MLS data found that detached home sales collapsed by 75 per cent in the few weeks after the provincial government announced it was introducing a 15-per-cent sales tax on foreign buyers of residential real estate in Greater Vancouver. Saretsky described the market as being in “absolute mayhem.” But other realtors told media it is too soon to tell what the precise impact will be on the housing market. Real estate agents say numerous deals have collapsed since the tax was announced, and some 3,000 to 4,000 home sales are in limbo, after the buyers failed to finalize deals before the new tax came into effect, CBC reports. But the Vancouver Sun reports it’s not just foreigners who are withdrawing offers: Realtors say local buyers are also pulling out of deals, on the expectation that the market will soften. Jonathan Cooper of Macdonald Realty predicted some of these collapsed deals would end up in court. “I think the next chapters in this story are going to be written by lawyers,” Cooper said, suggesting sellers could sue buyers who backed out of real estate deals, demanding compensation if they can’t find other buyers willing to pay as much for their houses. Did Liberal insider know about tax in advance? The issue of B.C.’s foreign buyer tax took on hints of political controversy Wednesday as a prominent Vancouver real estate marketer and chief fundraiser for the provincial Liberals denied he knew in advance that Premier Christy Clark’s government would announce the tax. 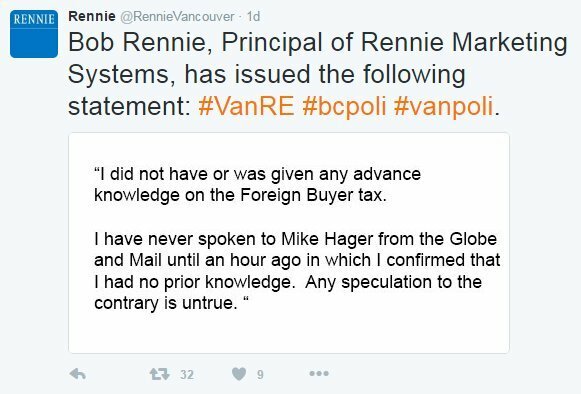 “I did not have nor was given advance knowledge on the Foreign Buyer Tax,” Rob Rennie, the “condo king” behind Rennie Marketing Systems, said in a tweet. A screencap of a tweet from “condo king” Rob Rennie. The tweet is no longer accessible at Twitter. The Globe and Mail cited Rennie in an article Monday saying that he knew three weeks ago the tax was coming, though he thought it would be in the 5- to 8-per-cent range, and not the 15-per-cent levy that was announced. Rennie denied ever speaking to the Globe for that story, but told the newspaper Tuesday that he had simply predicted that the government would apply a tax on foreign buyers. “I’m a pretty astute guy on strategy and real estate, and I made the assumption that something [else] was coming,” he said, adding he’s willing to resign as Liberal fundraising chief if asked. The foreign buyer tax could make it harder for Vancouver to reach its goal of becoming a major North American tech hub, Bloomberg reported Wednesday. The business publication noted that Vancouver already has “two strikes” against it in that effort: It has some of the highest house prices on the continent, and the lowest wages among North American tech hubs. Bloomberg interviewed a Singaporean computer scientist planning to move to Vancouver, who discovered he now has to find another $114,000 to cover the tax on the home he wanted to buy. “It’s a complete shock, a nightmare,” Eric Kong said. For all the talk about the foreign buyer tax, data from the region’s real estate board shows home sales in Greater Vancouver fell for months before the tax was announced. Sales fell 26.7 per cent in July from a month earlier, and were 18.9 per cent lower than they were a year ago. It was the fourth month of falling sales in the region. The numbers likely didn’t capture the last-minute confusion over cancelled deals ahead of the new tax. But prices haven’t followed sales down. The benchmark price for a Vancouver home hit $930,400 in July, an increase of 1.4 per cent from a month earlier, and 32.6 per cent higher than a year earlier. The article was originally posted on The Huffington Post Canada, August 3, 2016. Written by Daniel Tencer.